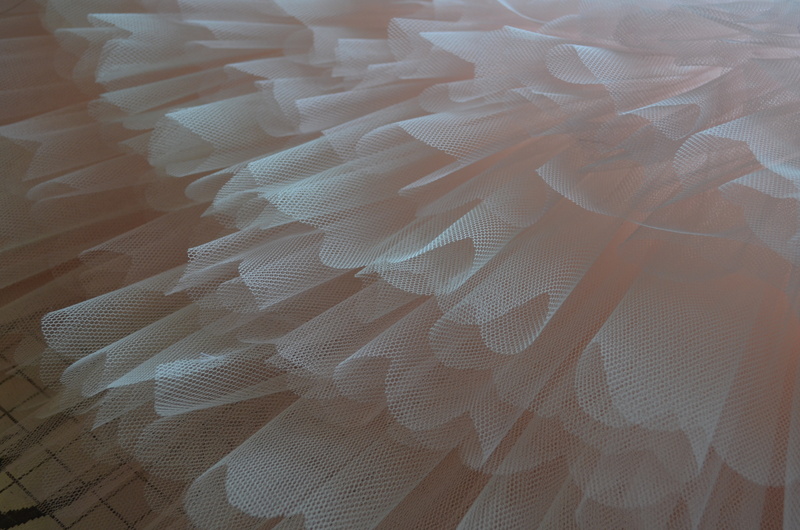 It really was a very busy year for me so blogging has had to take second place to actually getting tutus made. I promise to be a bit more organised in 2016 and blog a bit more detail rather than just photos. 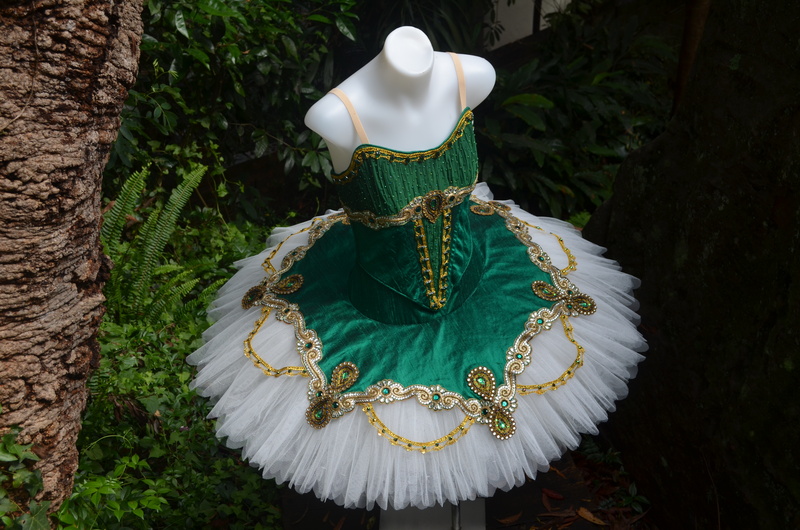 In the meantime, here are 5 traditional tutus I completed in the second half of 2015. 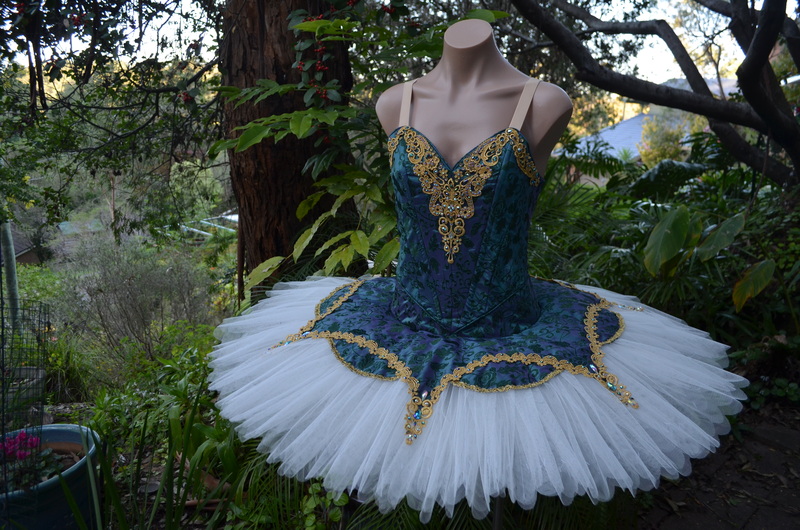 The diamond fairy was made with a lovely “dragon-skin” brocade from a favourite fabric shop in Sydney. The skirt was hooped to support the weight of the full lace overskirt. 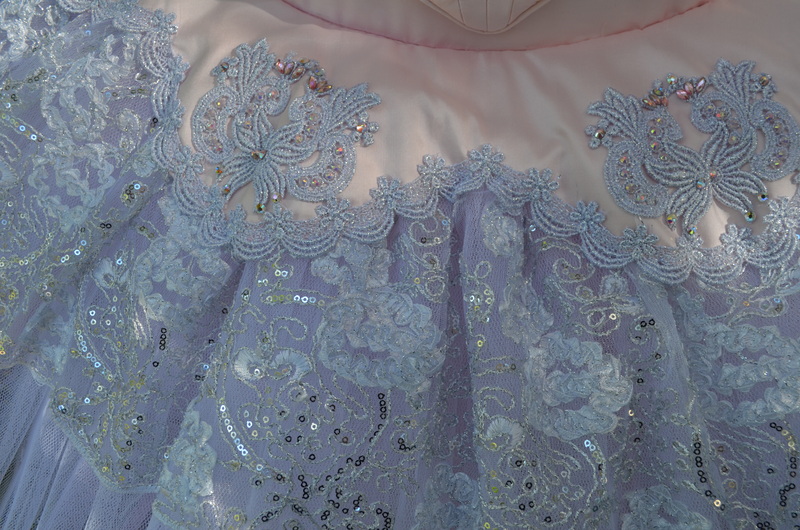 The Lilac Fairy was made from shantung and dupioni and decorated with French lace. 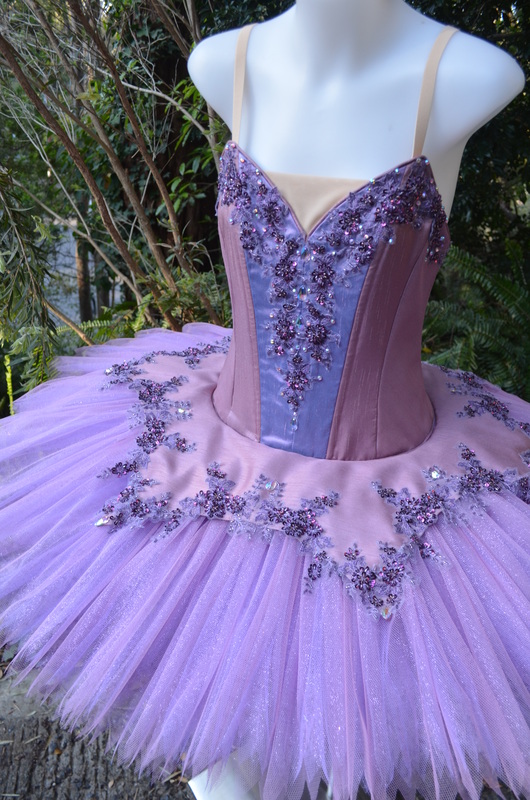 Glitter tulle in layer 2 made this Lilac Fairy really sparkle on stage. 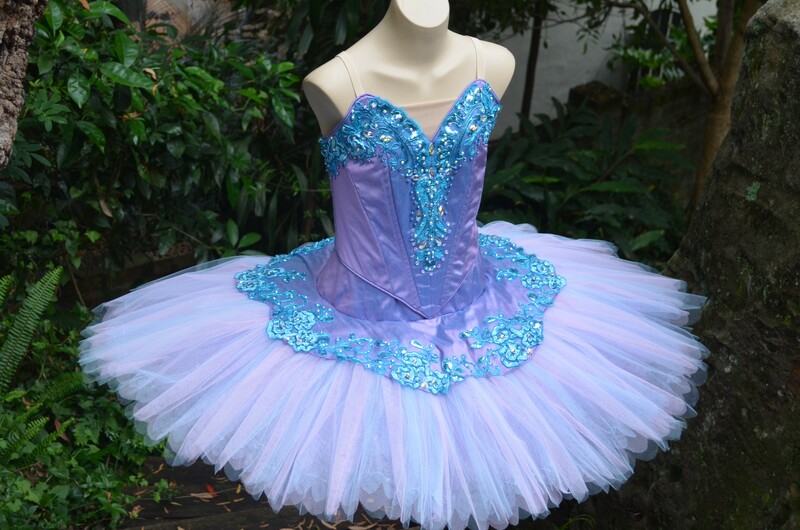 Another Lilac Fairy was made from aqua/pink shot dupioni and aqua corded lace. 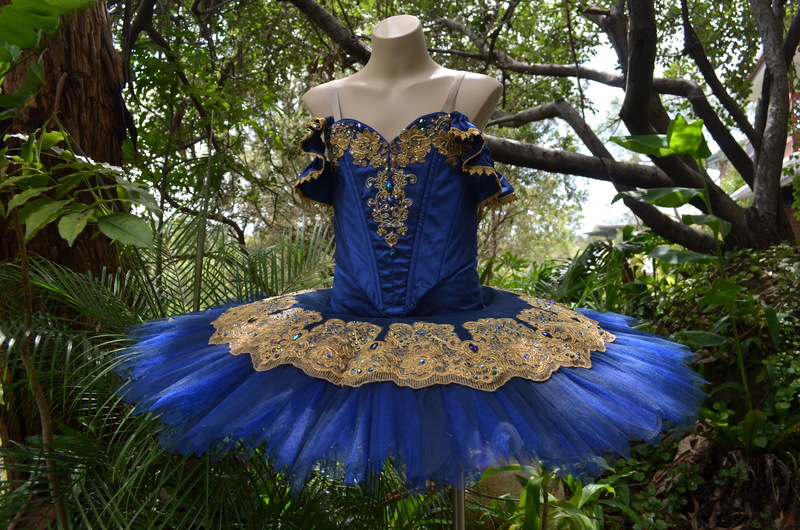 I also made 2 lovely royal blue tutus, one with gold and the other with silver. 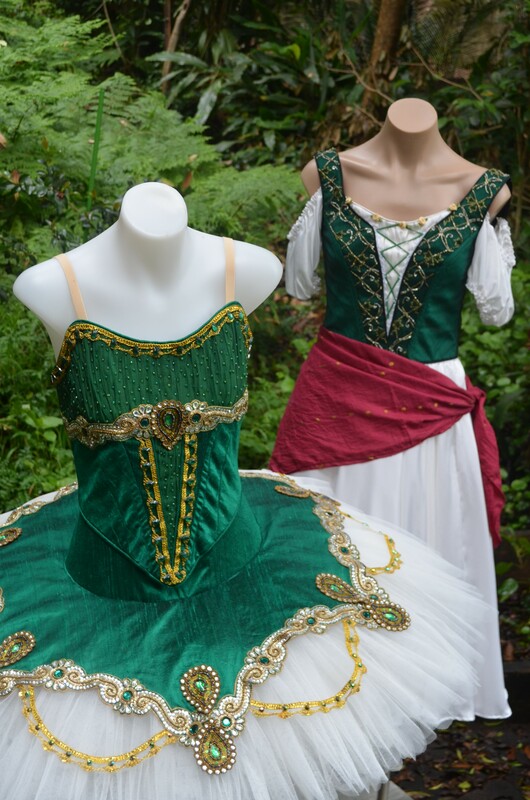 One of my US clients sent me a box of beautiful fabrics and appliques to make her daughter an Esmeralda classical tutu and a Peasant Pas costume. 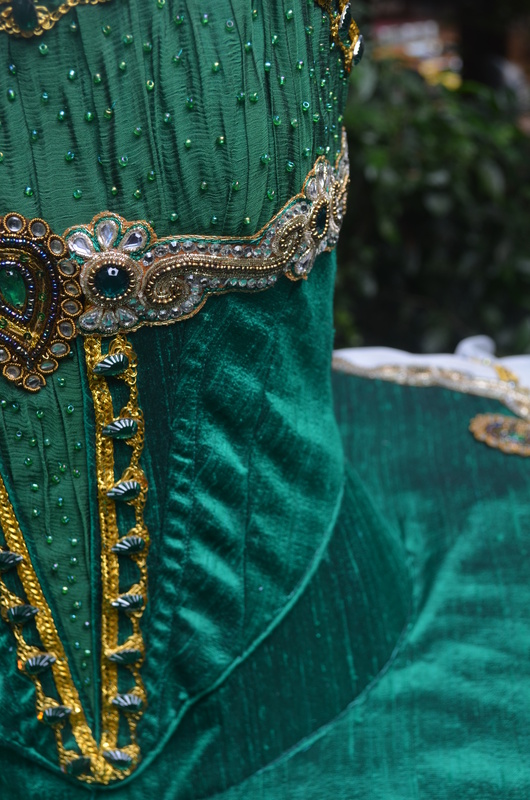 Both costumes were made from the emerald green dupioni but I slightly darkened the fabric for the peasant pas dress by overlaying it with fine black tulle. 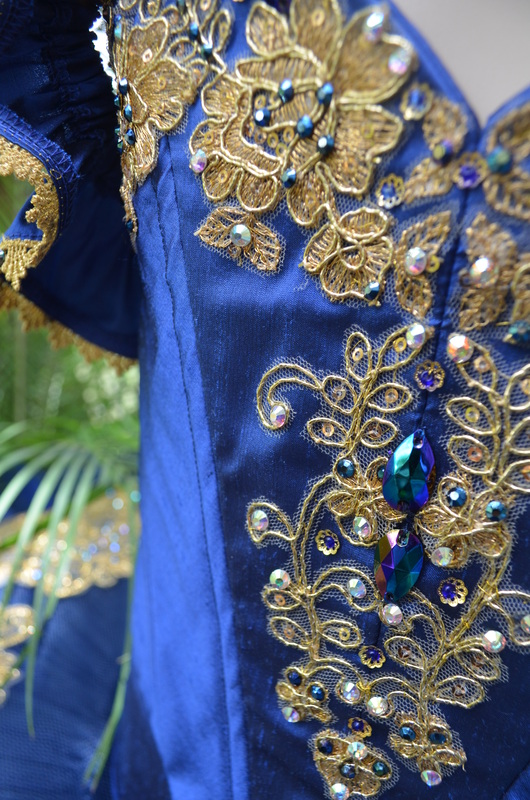 The middle panels of this costume were made from beaded silk chiffon overlaid on the silk dupioni. The costume was finished off with a hip scarf made from crimson sari silk embroidered with gold medallions. The off-the-shoulder sleeves, faux chemise and overskirt were silk chiffon. 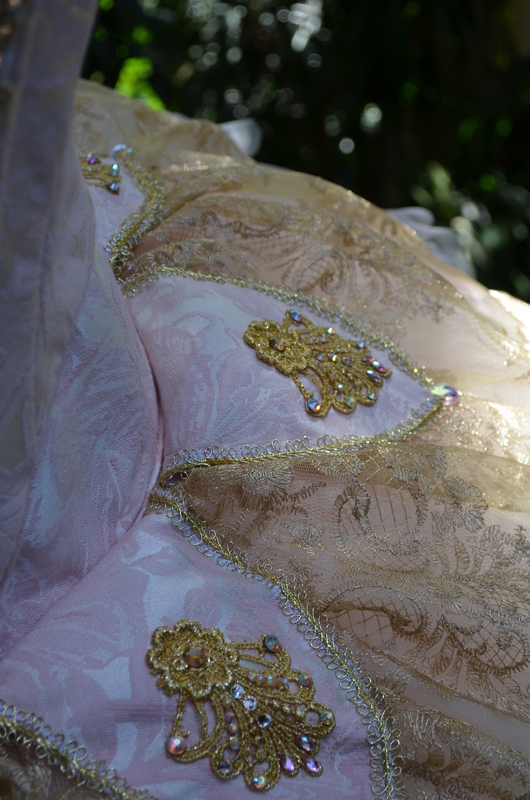 The underskirt was 3 layers of fine tulle. 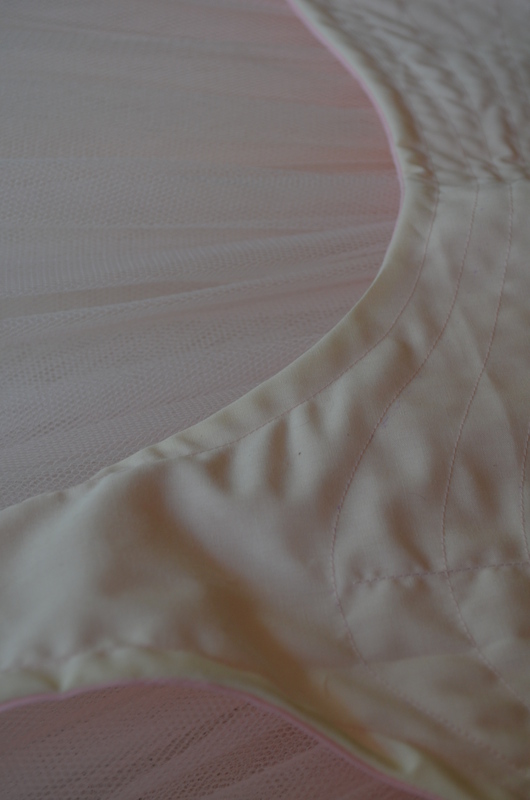 The tulle was sewn in 4 gores per layer to reduce the amount of bulk at the waist. Accompanying the emerald dupioni was some forest green silk chiffon. 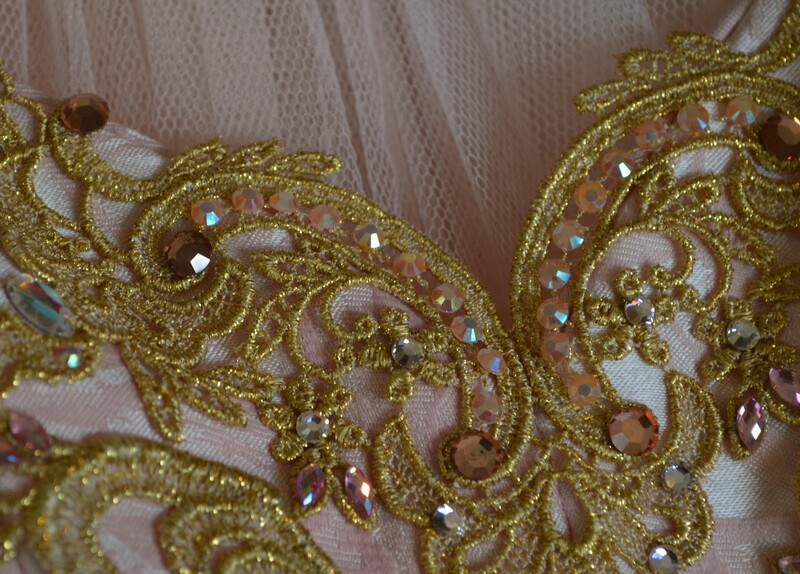 I used this as a ruched chemise on the top part of the tutu. 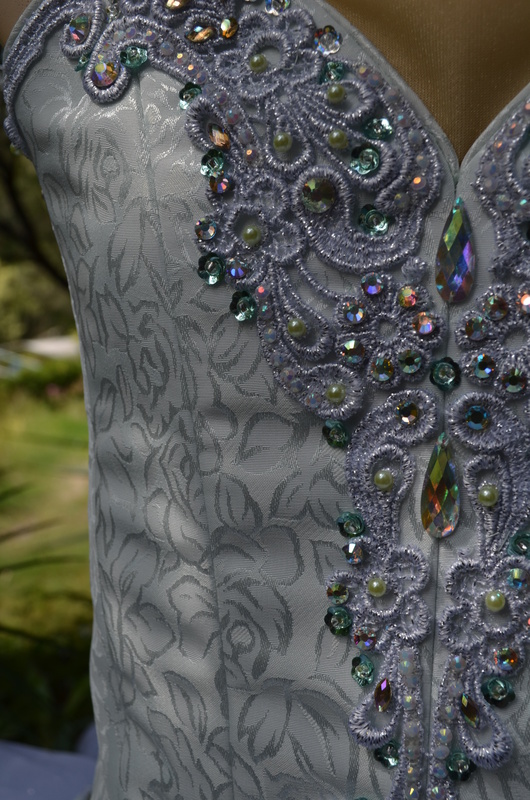 To add a little more drama I sewed a scattering of green seed beads across the bodice. The Indian appliques that I was sent were a very pale gold. The green silk was such a strong colour I thought it needed a little something to balance the the design. A robust yellow gold trim did the trick. A scalloped ivory skirt finished the picture. And here are the 2 costumes together. Pale and pastel-coloured traditional tutus are very popular but I always like to sneak a little bit of extra colour into them. 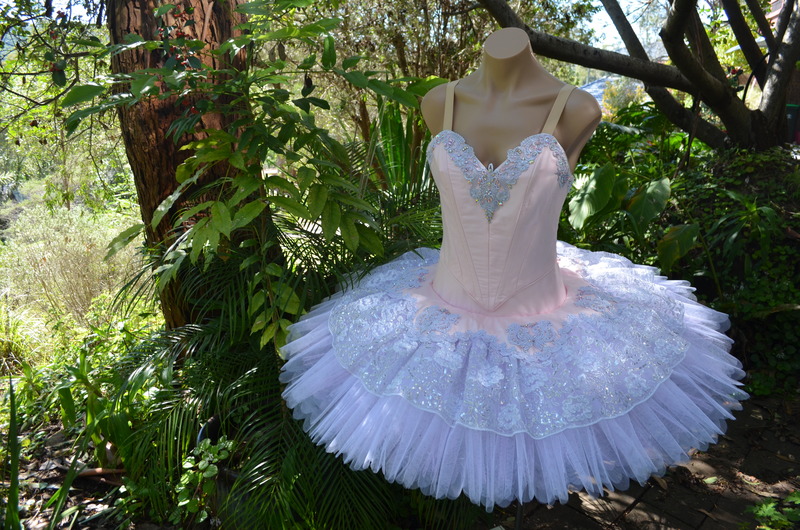 For this pale mint brocade tutu I decided to highlight the mint colour in the skirt and enhance it with a little glitter tulle. 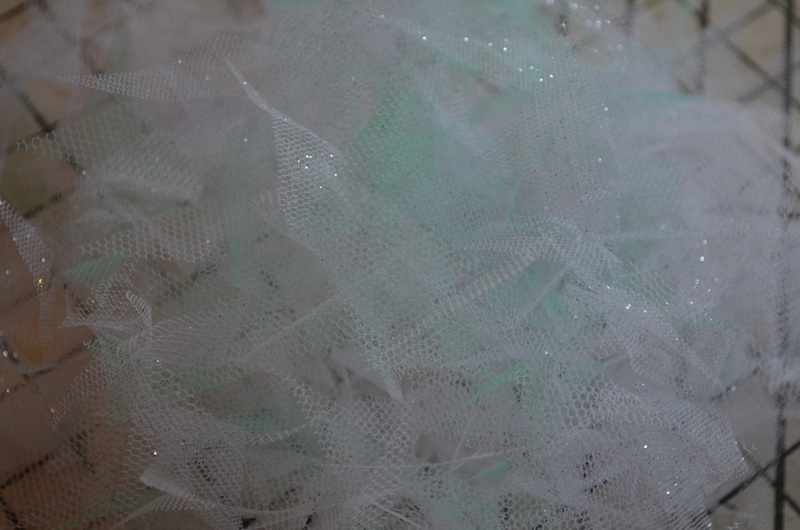 And if you’ve wondered how I get all those layers (up to 10) onto a tutu it’s a combination of determination, brute force and sewn on guidelines. I alternate the thread colour so I can tell where I’m up to. 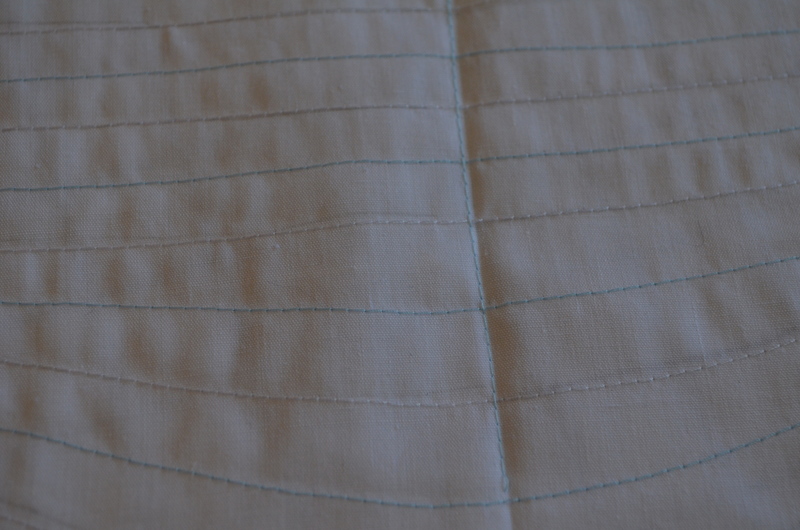 After clipping the net I sew the widths together; 5 for the top two layers, 4 for the next 2 and 3 each for the remainder. Then I gather and steam them. Now, while this layer looks like a very strong colour, 2 layers of white above it and 7 layers of white below it will dilute the colour beautifully. Positioning is important. If you put a strong colour at layer 2 you get more distinct radiations of colour and at layer 4 the effect is too light. The mint brocade was teamed with silver venise lace. 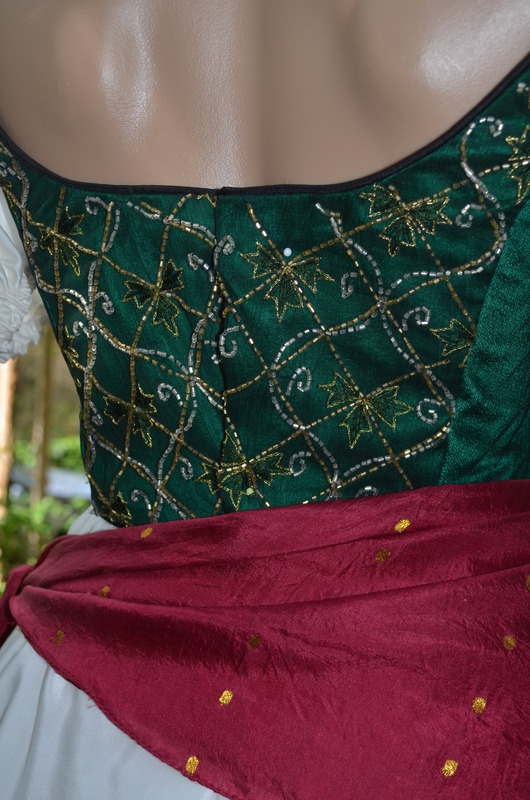 I cut up a few motifs to give a long decorative style for this Russian bodice and toyed with a few placements. When I was happy with the placement I got to work with the rhinestones. 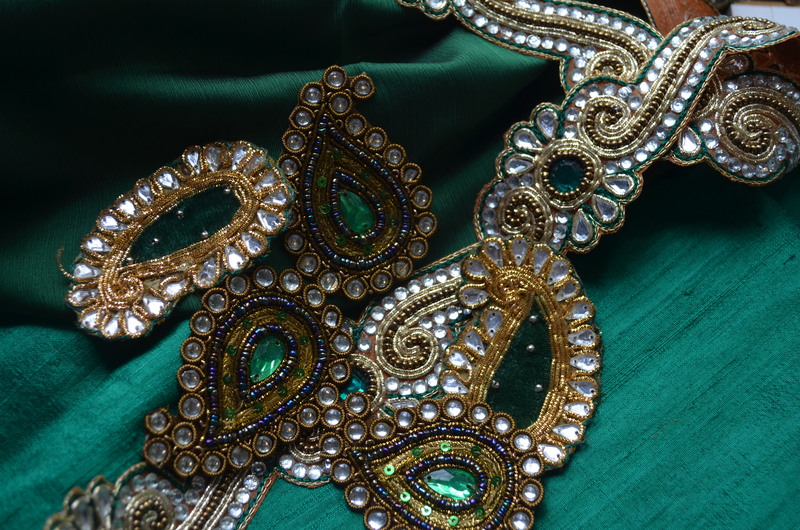 To bring the pale green out of the fabric I used a combination of stones and pearls that had a green base. 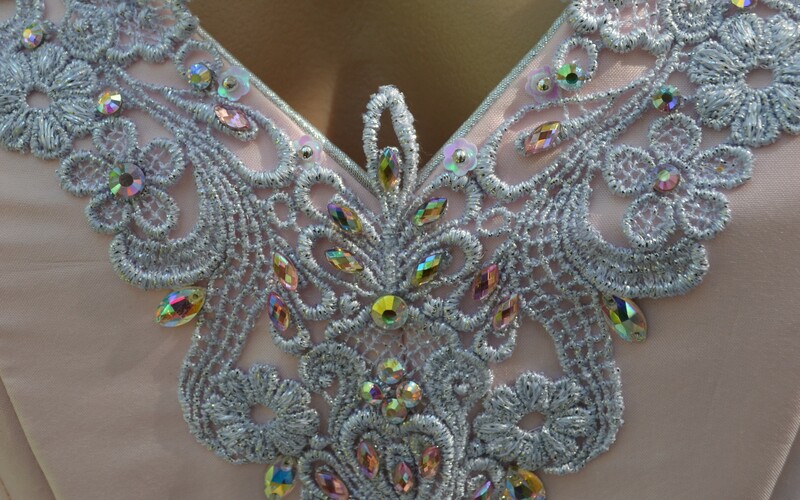 It looks a very different applique once the stones and pearls are attached. 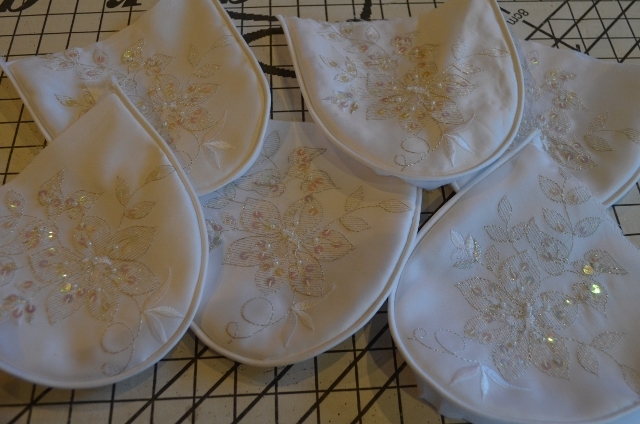 For the plate, the appliques are cut and arranged first and then sewn to the plate. 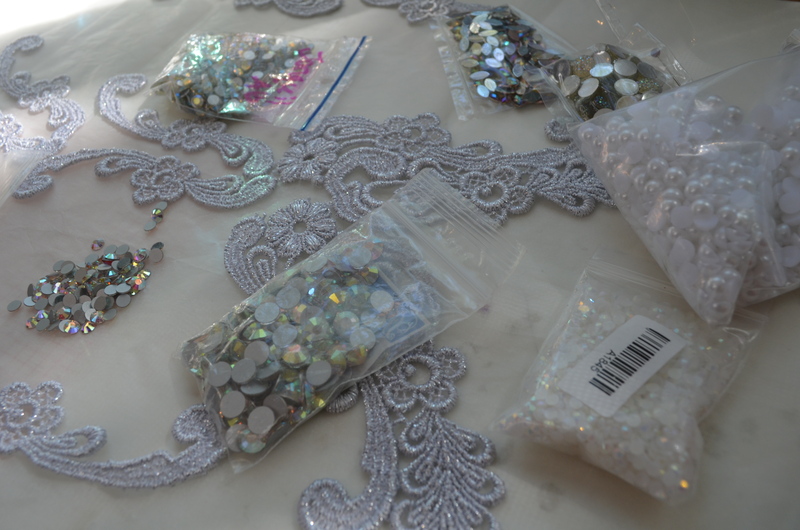 Once they are sewn to the plate then I attached the rhinestones and pearls. 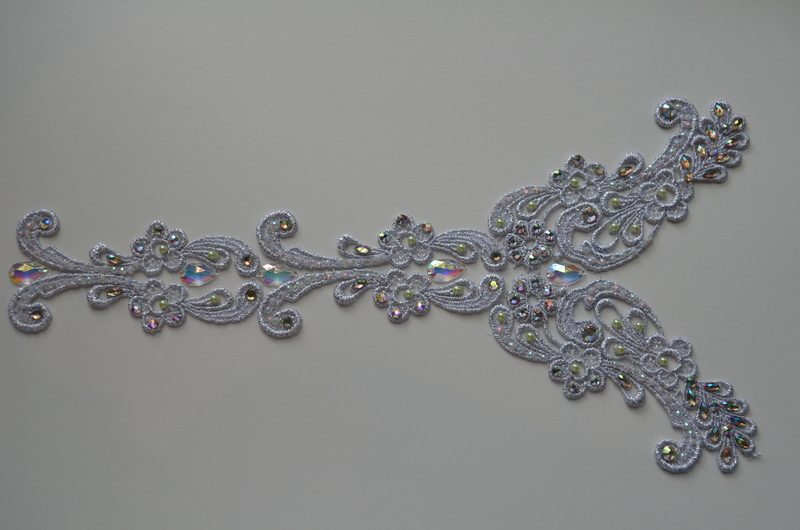 The rhinestones add a lovely definition to the plate decoration as well as subtle ballet glimmer. You can just see the glitter net showing through. 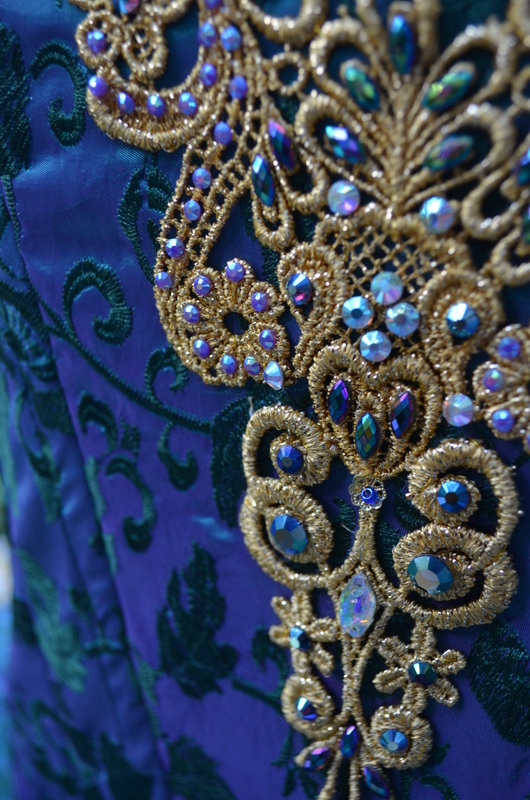 The bodice decoration had a lovely mixture of green stones and peals as well as a few little green flower shaped sequins. I was very pleased with the final design and loved the glow of pale mint in the skirt. I’ve been flat out lately and forgetting to take photos but I’m sure you’ll forgive me just posting some pictures of finished tutus rather than construction steps. I often will buy a couple of metres of beautiful fabric if I can see a tutu in it. 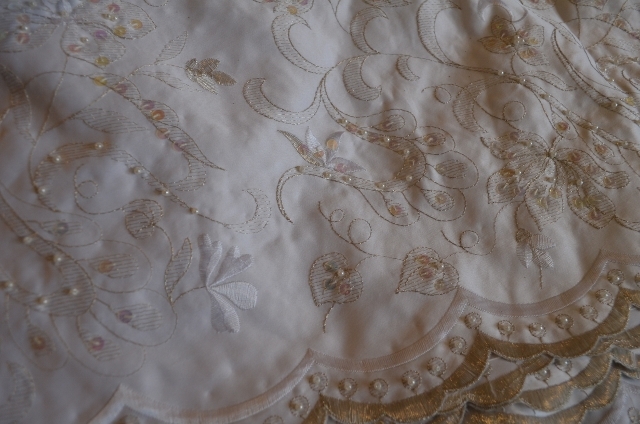 I could not resist this beautiful embroidered taffeta. It is green and is shot with a purple-fuchsia colour. The dancer who chose it has flaming red locks and ivory skin. It was a perfect choice for her. 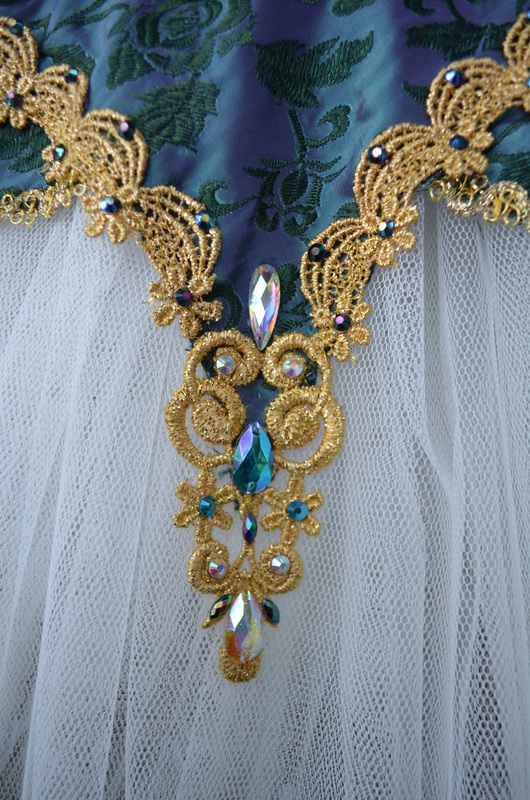 The plate was made with long points that echoed the bodice decoration. And for a soft effect the skirt was cream. White looked too harsh and ivory wasn’t right either. The next tutu was another pink Aurora. This one was pink and silver and had a delicate feel. Both of my recent Auroras were for the same ballet school so I wanted them to stand apart but both be lovely. 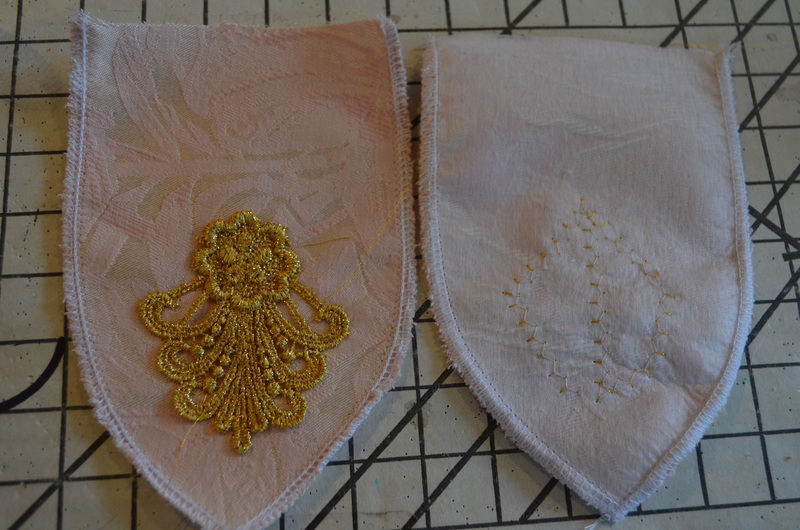 The pink silk we chose was a little too light when it was lined so I put a layer of darker pink poplin between the silk and the drill to give a little more strength to the colour. 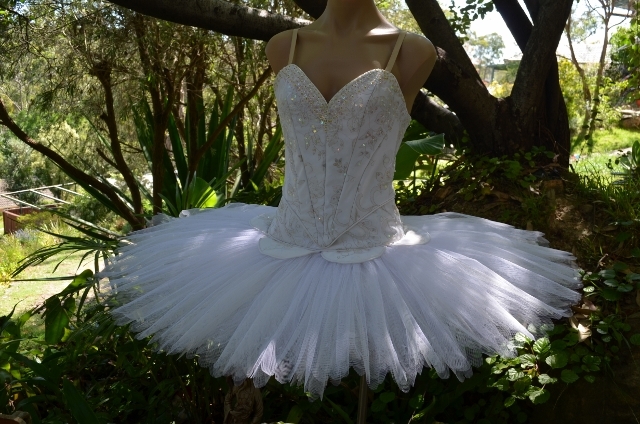 The silver overskirt and venise lace gave the tutu an airy ethereal look. 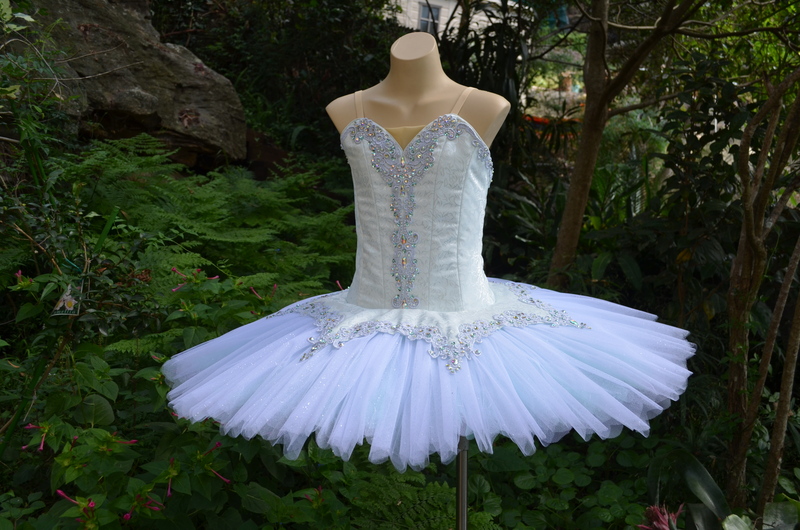 And finally a little tutu for a very dedicated young 10 year old. 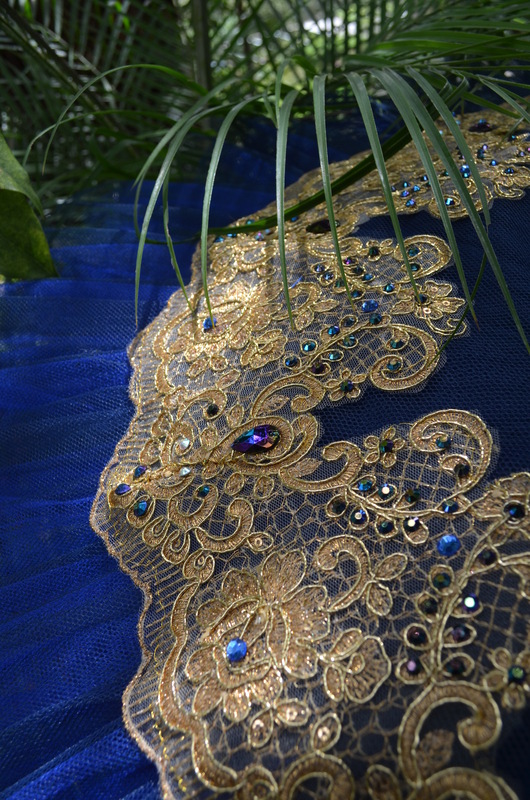 We used royal blue dupioni and gold corded lace for a regal look. There was no plate but I matched the colour of the skirt to the bodice so that the line of the bodice carried down onto the skirt. 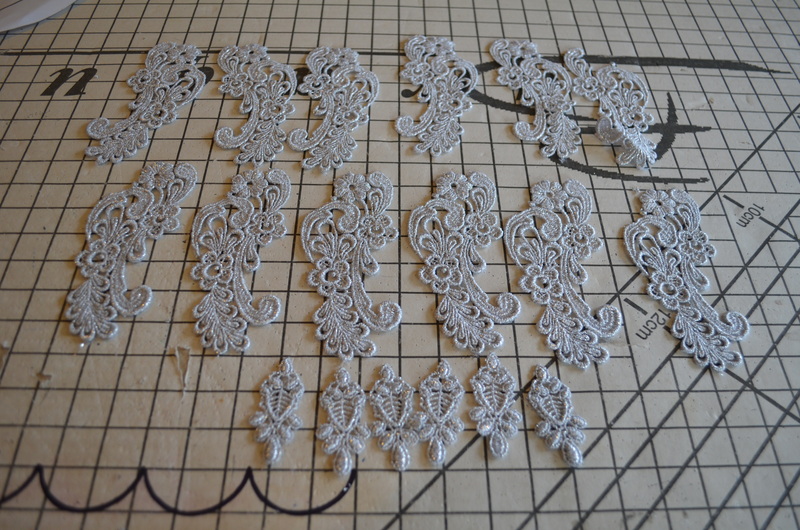 I used the corded lace to make a flay lace overlay. 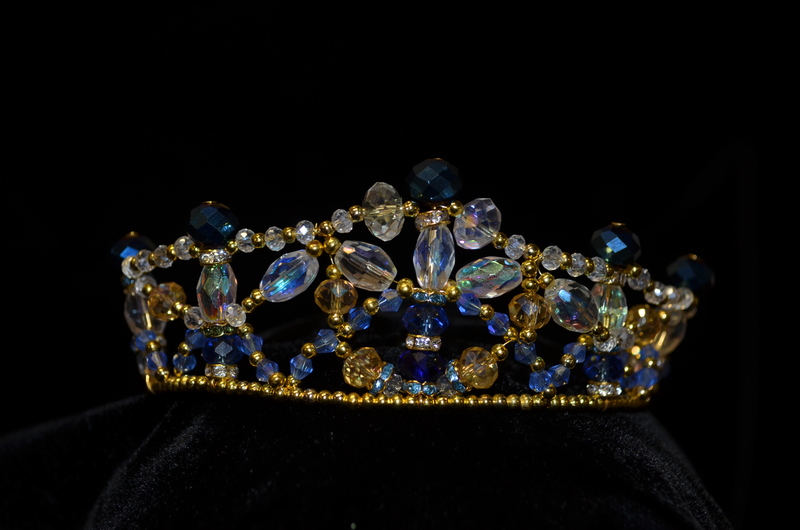 I used blue rhinestones on the lace to increase the negative space in the design and break up the sold stretches of gold. and I finished off the ensemble with shoulder frills and a tiara. I’ve had a groundswell of Auroras this year, in all their glorious girly pinkishness. It was almost enough to make me consider frocking up myself (nope, still in jeans and a t-shirt!). My client brought along some fabric she had found and some ideas and we set to work. First there was the dyeing of the net to a lovely soft colour. While good quality net comes in about 30 different colours subtlety of shading is not one of the characteristics! I dyed the net to be the same soft colour as the bodice and then because she is a Princess I simply had to scallop the edges of the net. The knickers had to match the net so I toyed with a few variations of pink and ivory poplin and voile until I came up with the best match. You can just see the pink liner peeking through. It gave the perfect blush to the ivory to match the net. The lines on the pants are my sewing guide for the 10 layers of net. 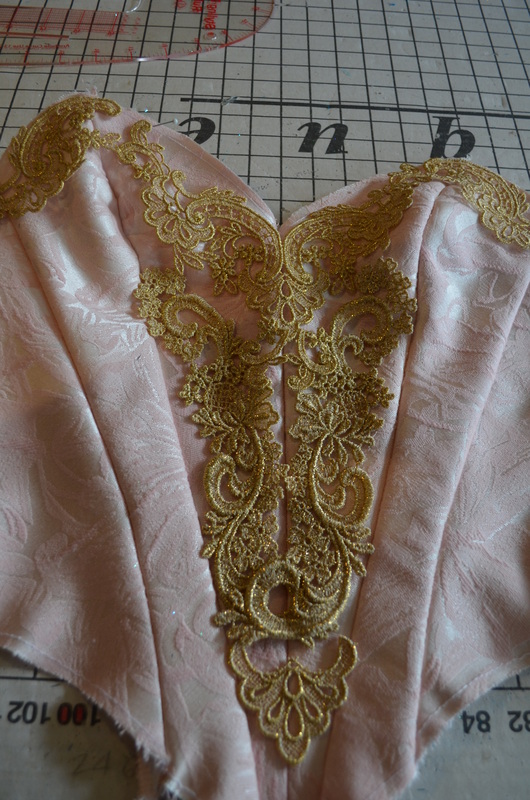 I made up the bodice to fitting stage and then worked out my placement of venise lace. There are about 3 different motifs in this design cut up and rearranged. Once I’d finalised the design I photographed it as a record and then decorated it with pink and apricot rhinestones. 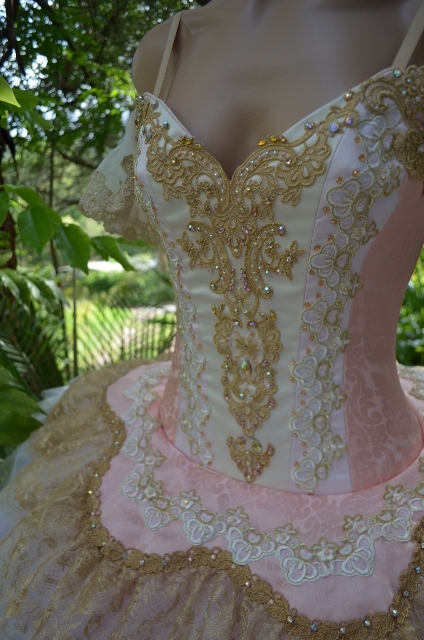 After the fitting I finished the bodice and sewed on the appliques. Here it is sitting against the pretty dyed net all steamed and ready for the next stage of skirt construction. 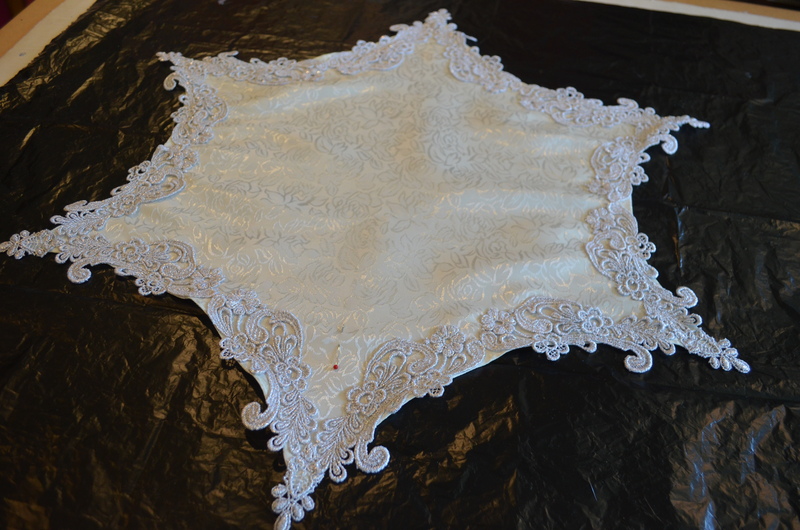 Because we wanted a detailed baroque look, we decided on 8 small petals around the hipline instead of a solid plate. 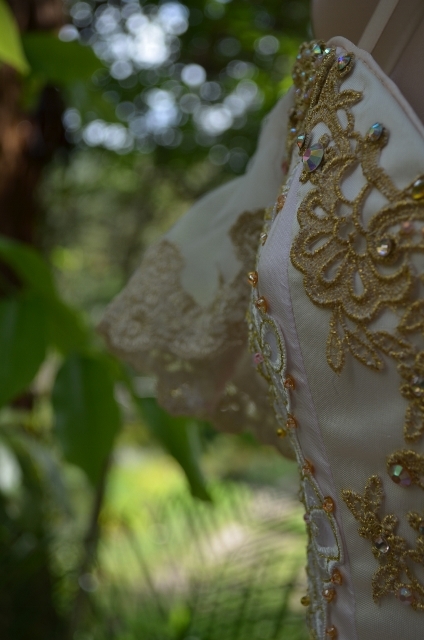 Each petal was lined with interfacing and the appliques were machined on with gold metallic thread. 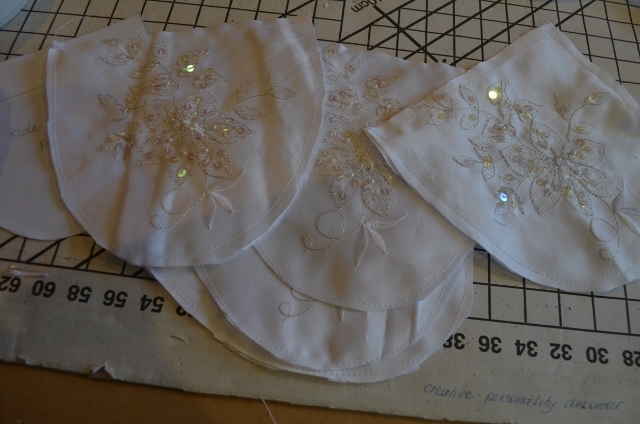 If you bling them up first you have little choice but to hand sew them on … ask me how I know! Sometimes I still get carried away and forget and bling them first. Then I smack myself in the head or say bad words. 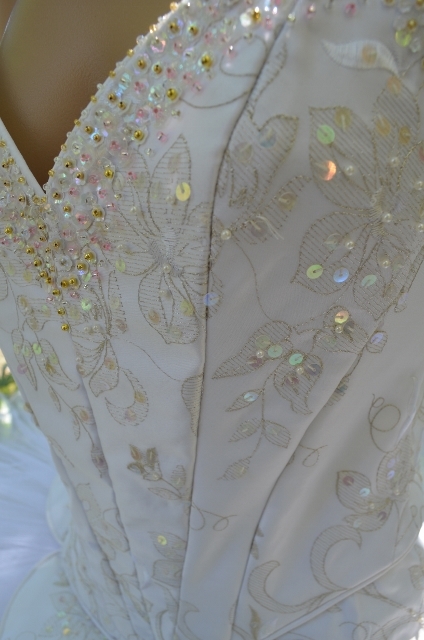 The petals were then edged with gold trim and THEN blinged. 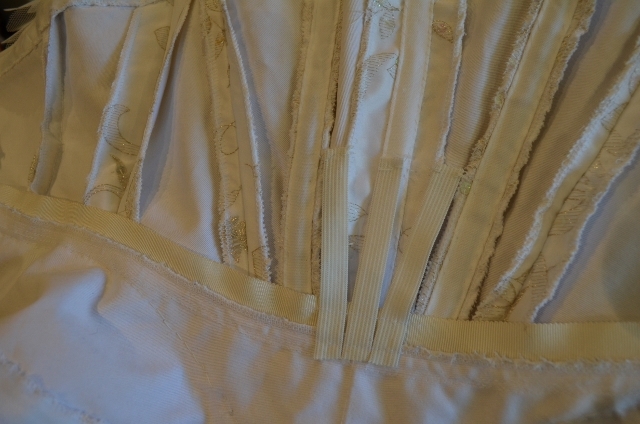 The inner edge of the petals were clipped to fit the hip-line and hand-sewn onto the piping of the basque. I find the piping really useful as an anchor point for the plate. I don’t sew the plate (or petals) between the basque ans the top layer of net as I like to wiggle things into place when the skirt is finished. This is because the hip-line is more of an ellipse than a circle so clipping for the curve at the front and the back is much shallower than for the petals at the side. 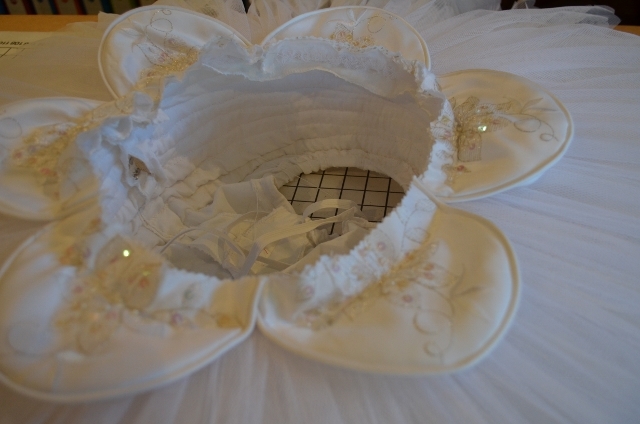 It also means that it’s easier to change the decoration on the tutu at a later stage. Petals are great because you can position them either side of the centre back and you don’t have to make a placket for the back opening. 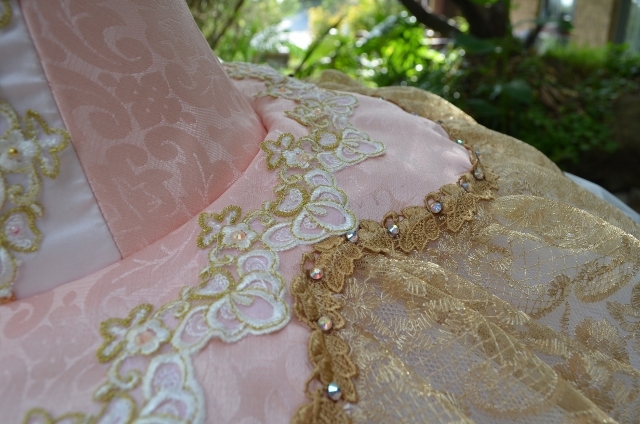 After sewing on the petals I gathered some light gold lace and tucked it up underneath the petals and stitched it down. 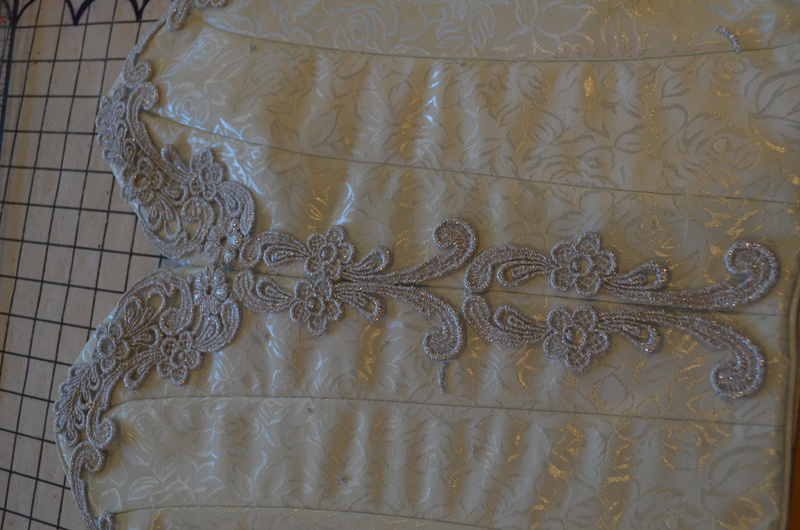 Then I stitched the petals down over the lace into the skirt and finally sewed down the lace to keep it in place. And there you have Aurora, the second one for the year! Miette is one of Sleeping Beauty’s fairies. The name means ‘falling breadcrumbs’ and comes from an old Russian tradition that spreading breadcrumbs on a girl’s cradle will bring her children when she marries. 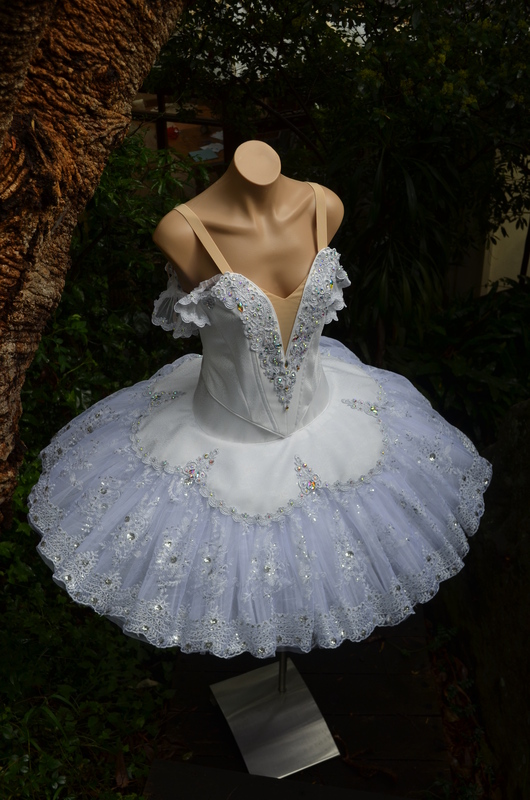 White is appropriate for this tutu but as it will be on its way to the Prix de Lausanne 2015 we thought a “special” white fabric would be a good choice. I cut the pattern pieces and serge lined them to a strong backing fabric. there was a lot of “de-beading” required to get these pieces under the presser foot. I also had to find areas of the fabric to take the bias trip from for the piping. 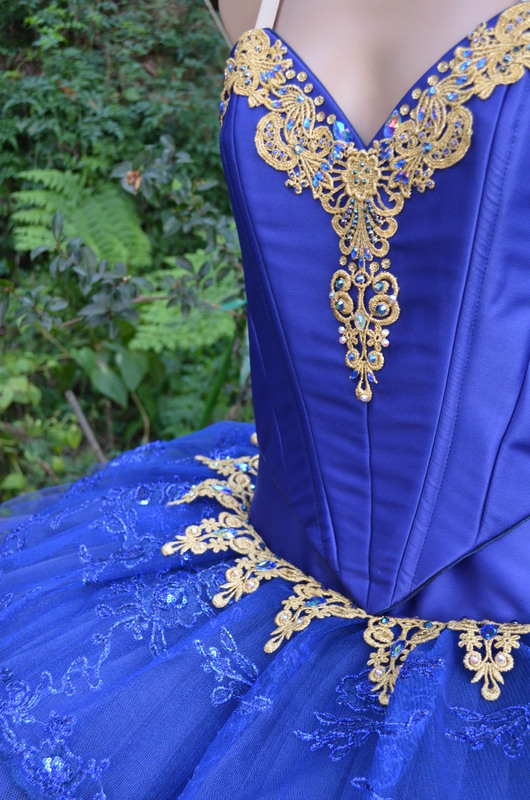 I love the look of a piped bodice. 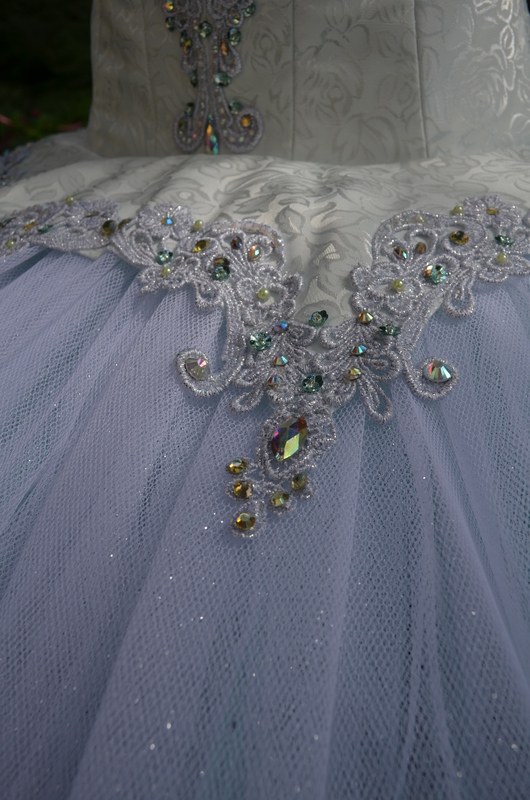 Even though this is just a plain tutu, Olivia wanted something a little special on the bodice just for her so I did a bit of therapeutic hand beading. Although this can’t be seen from the audience it adds texture and I’m sure it delights Liv. As you can see I have my coloured pins ready for this job with my white pins outs of harm’s way! 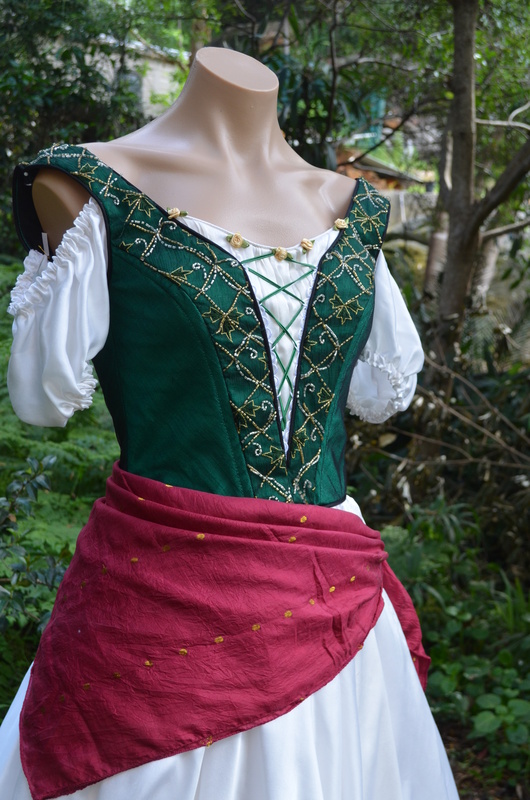 The basque and bodice can either hand sewn or machine sewn together. 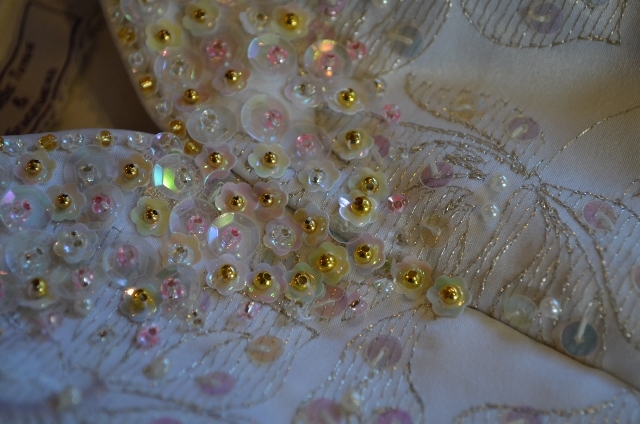 Due to the beading and sequinning on the fabric I though hand sewing would be the best option! 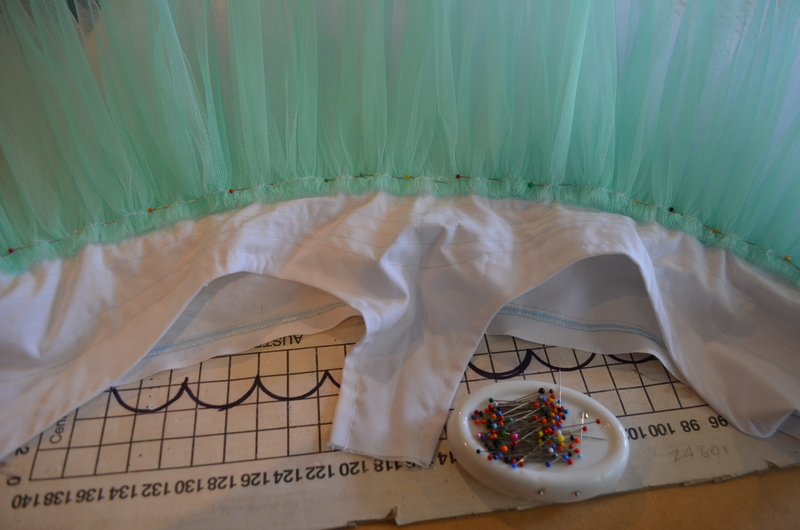 I also sewed the basque to the tutu skirt by hand in this case. 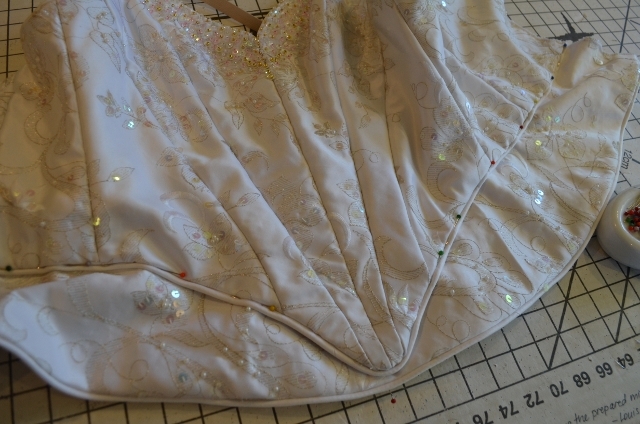 I don’t sew the bodice all the way around but leave the point free. I attached elastic stays from the centre panel to the waistband to allow a little bit of movement for deep back bends. The centre front seam is boned with spring steel. This keeps the point firm and only allows movement backwards and forwards. In the photo below the steel has been cut. The bottom one has been filed down a little to remove the sharp edges that can work their way through the boning casing. After this I dip the ends in a plasticiser that creates a much softer edge and stops rusting. 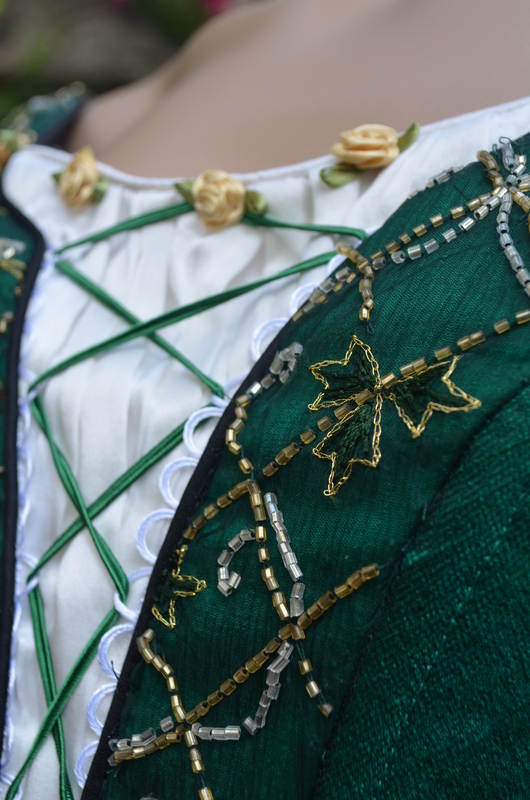 The bust seams (and sometimes the side seams) are subject to more varied movement than the centre front seam so they boned with spiral steel that allows movement from side to side as well as back and front. For the nerdy science types out there (that’s me!) 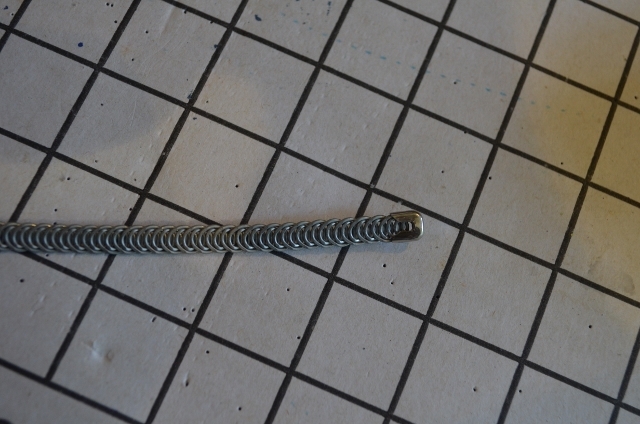 spiral steel is, in fact a flattened double helix. 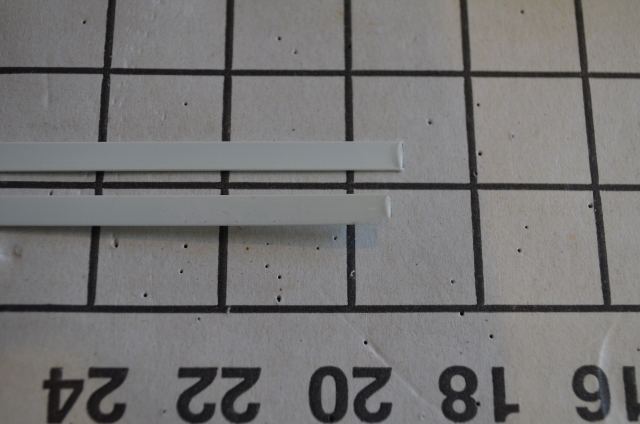 The ends have four sharp points so they need more than filing and a bit of plastic. 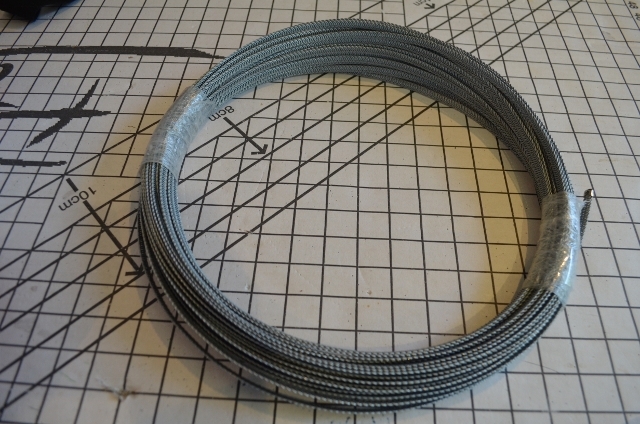 I think the hardest part of boning a bodice is getting these little aluminium caps on. Bodice complete now it’s fun time with the skirt. I used a mixture of ivory, cream and white net in the skirt. Even a plain ivory skirt needs a bit of life! Tacking starts at the bottom with the first three layers tacked every 5 cm or so with an individual loop or gun tack. Then the next 2 layers are dropped down and they are tacked together into the top layer of the first three tacked layers. This is continued to the top. It means the layers are all working with each other as well as within their own little groups and creates a live skirt. 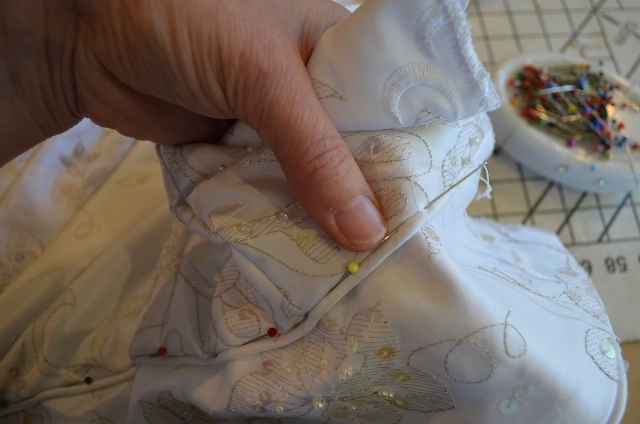 There are lots of other ways to tack that will result in different styles of skirt. We decided on a just a small hip plate to keep the decoration minimal. I used the motifs in the fabric for each of the 6 petals. And then I finished them neatly with self piping. there were no mirror images in the fabric but the design is elaborate enough to compensate for the lack of symmetry. I added the petals to the top of the skirt and then added the basque as I wanted to feature the piping on the basque. 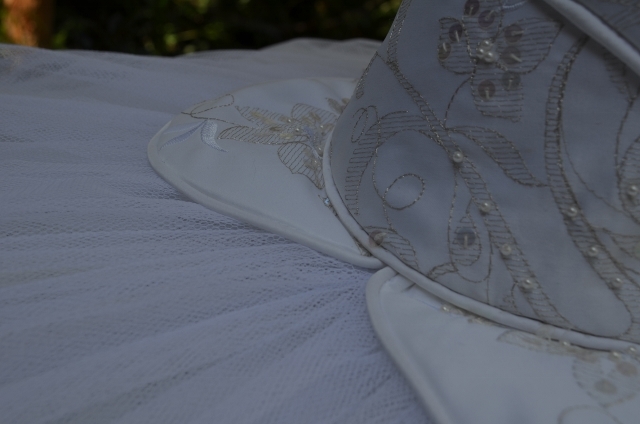 Alternatively plate or petals can be added later which makes it easier to remove them if the tutu is to be “reinvented”. 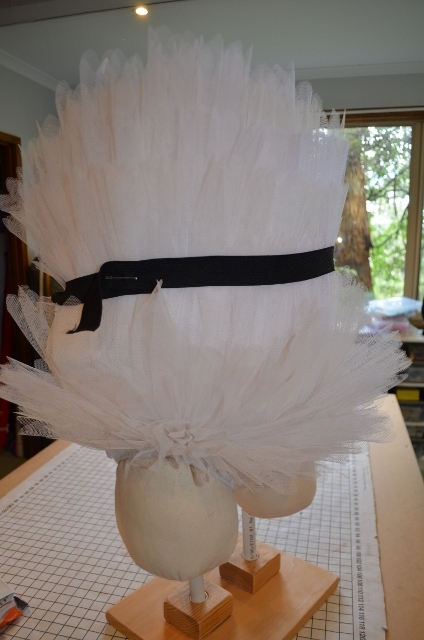 You see here the piping is clearly visible and adds to the finish of this simple elegant tutu. 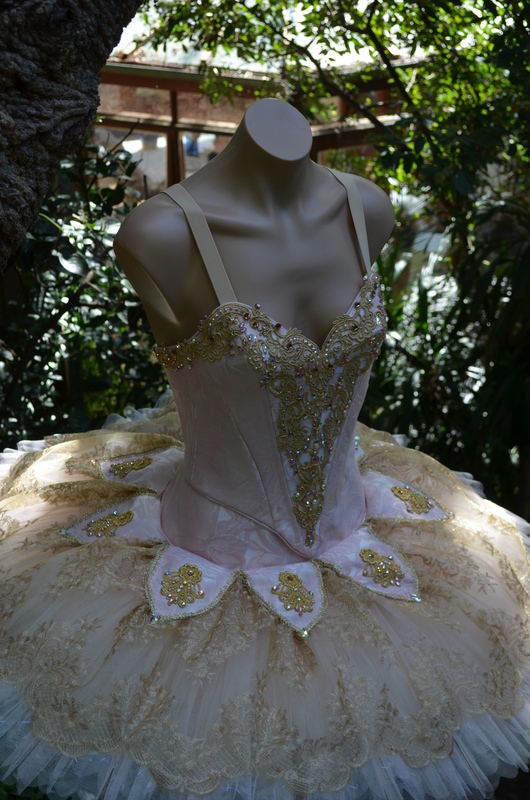 The beading brings in a little bit of pink and gold to the tutu. It’s important in any field to keep refreshing skills and learning new ways to do things. To this end I spent a week in Victoria’s beautiful Woodend at a tutu seminar run by the wonderful teachers Helen Rodwell and Sylvia Heather of Sew Classical Tutus. 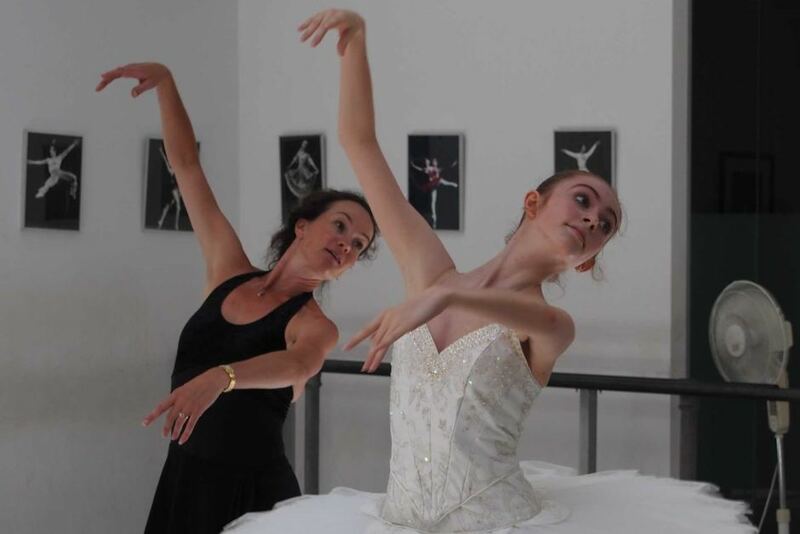 I also stayed on for a couple of days to lend a hand to the very talented Dani Legge, who has been my tutu mentor for many years, while she ran her stretch tutu class. Tutu classes are hectic. While you’re concentrating on your tutu you keep an ears and eyes open for what others are doing and drop everything to watch a demo; hence no progress shots with this one, just some pretty pictures. the inner princess triumphs again! 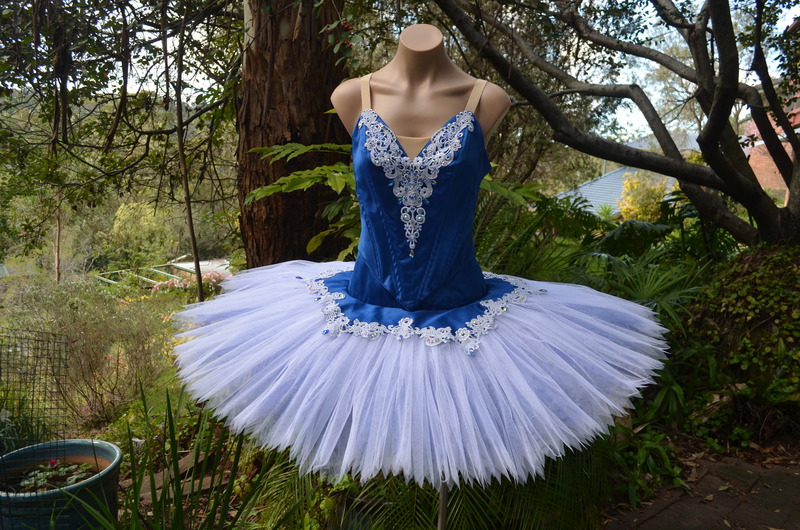 As this was to be a ready to wear tutu I chose a design that would have wide appeal and could be used for a variety of variations or solo pieces. 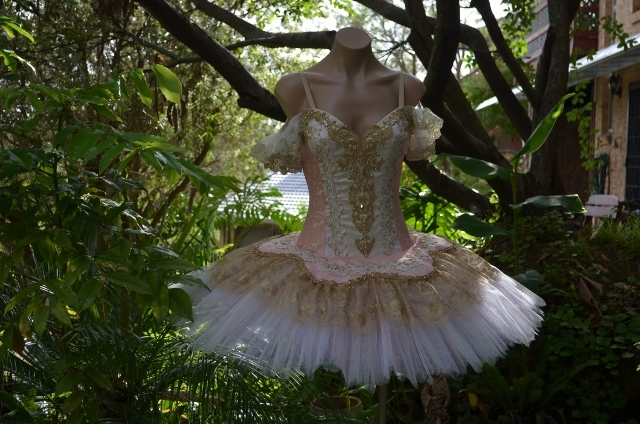 The 12 piece bodice has three colours, ivory silk centre panels, pale pink middle front panels and apricot brocade for the remaining 8 panels. 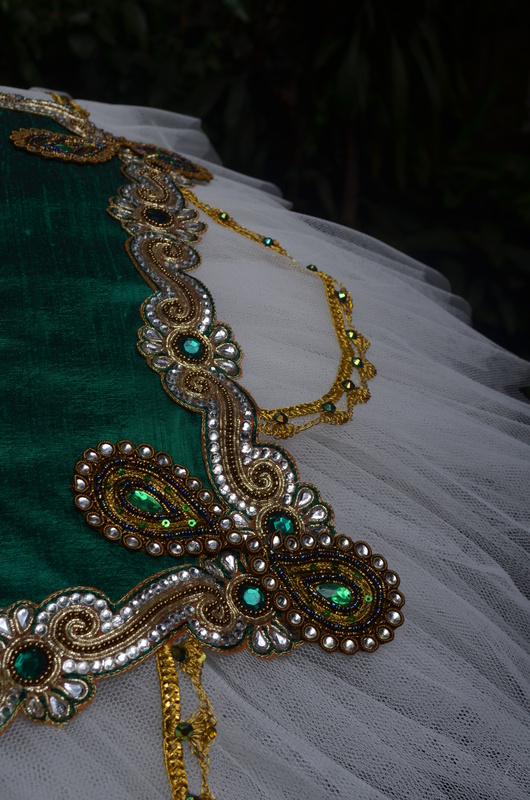 I was keen to enjoy the embellishment on this tutu and did a lot of hand beading as well as cutting and rearranging venise lace appliques. 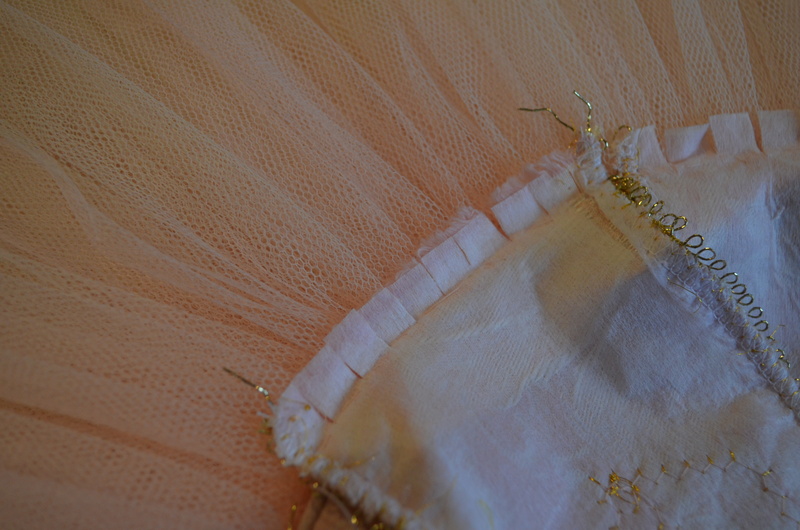 There are about 4 different gold colours on this tutu but they have blended well. I was chasing a rich, ornamented baroque look with a strong textural focus. 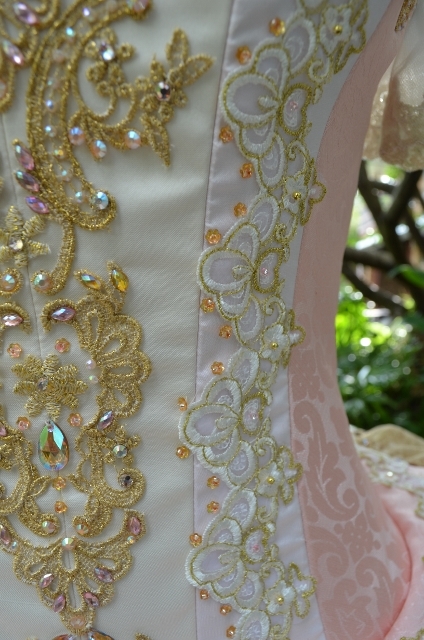 The final touch was the brocade plate with a light gold lace overlay. Bright gold did not suit the overlay so I tried a beautiful coffee-gold venise lace I’d had stashed away. Being at tutu school meant I could traipse around the classroom asking for advice and comments! Thanks to everyone who helped me with the decisions! 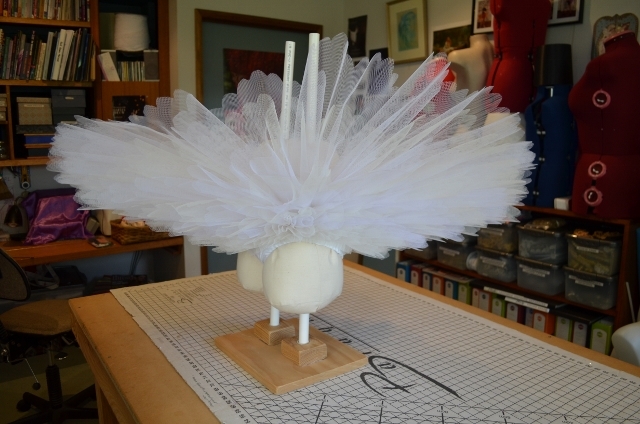 I had a wonderful time at the tutu seminar; I worked hard, unpicked things, talked tutus, laughed, talked more about tutus and gushed at other folks’ beautiful creations. If you read my blog because you want to want hints on tutu, leave the pets, kids and spouses at home and do a course!